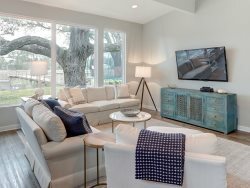 Stay in style with Southern Belle's vacation rentals Savannah GA. Our ideally located Savannah vacation rentals put you near everything you want to see in the Historic District. Walk everywhere, explore nearby attractions like Tybee Island and then return to the comfort and privacy of our Savannah vacation homes for a good night's sleep. We have such a large variety of properties that you will have no problem finding the vacation rentals Savannah GA that perfectly fit your needs. If you're looking for a condo near Forsyth Park, we have several. One of these is Forsyth Park Avenue Haven, which can accommodate four guests in one bedroom with one bathroom. It's just under 900 square feet and is located on the southwest end of Forsyth Park. Like all of our Savannah vacation rentals, it's bursting with great amenities. It's within walking distance to Forsyth Park, and features an outdoor patio with seating for four to provide an extra element of comfort and relaxation. For your entertainment needs, we offer cable TV and wireless internet. Niceties include an iron and ironing board, hairdryer, drip coffee maker, washer and dryer, a queen bed and pull-out sofa. Our Savannah vacation homes are expertly maintained and decorated inside and out. This property features a cozy sitting room set off by a nostalgic brick decorative fireplace and a flatscreen TV on the wall above it. The room also has a ceiling fan, wood floors, a writing desk and a plush comfy sofa that pulls out into a bed. In the back part of the room is a small drop leaf table with seating for two. Nearby is the full gourmet kitchen, featuring double sinks, a range and oven, microwave and refrigerator. There's also a breakfast bar in the back with seating for two. The one bedroom features a comfortable queen bed with a bench at the foot, plus a ceiling fan, floor-length mirror and two nightstands with lamps. The location will put you just to the south of Forsyth Park. When it comes to shopping, make sure to check out Broughton Street, City Market, River Street and Whitaker Street. A fun day trip when you stay in Savannah vacation homes is the short drive to Tybee Island. This charming Atlantic beachfront offers the opportunity to play in the sand and surf as well as explore some of the top attractions such as the Tybee Lighthouse and the Tybee Marine Science Center. You can simply relax and explore the river and ocean beaches and eat at waterfront restaurants, or you can get active and rent bikes to tour the island or head out on a charter for fishing or dolphin watching. Water sport equipment and lessons are also available. Start your trip to Savannah on the right foot by booking Savannah vacation rentals with Southern Belle. Find your favorite Savannah vacation homes conveniently right on our website and either book from there or give us a call today. We look forward to your stay!